There were four different types of track used by the Churchill: Riveted, Heavy Cast Steel, Light Cast Steel and Manganese. All four types of track were composed of shoes connected together by pins and were designed to run dry requiring no lubrication. 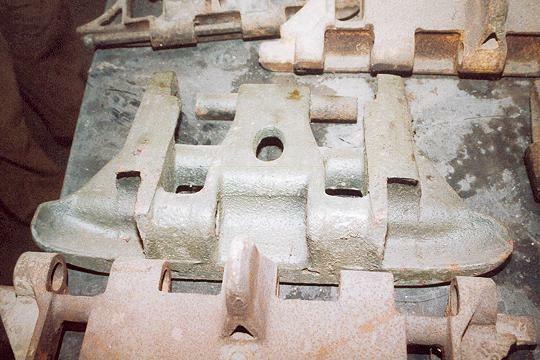 The Riveted track was used on the very early prototypes Churchills and appears to that desinged as part of the A20 contract using pressed steel face plates that were riveted to the underlying track. This track type was is only to be found on the very first protoype and producion vehciles and was soon replaced. Of the three later track types the Heavy Cast Steel track was the first to be produced, but perhaps surprisingly all three track types were designed within a relatively short space of time, and later all three would see simultaneous active service. 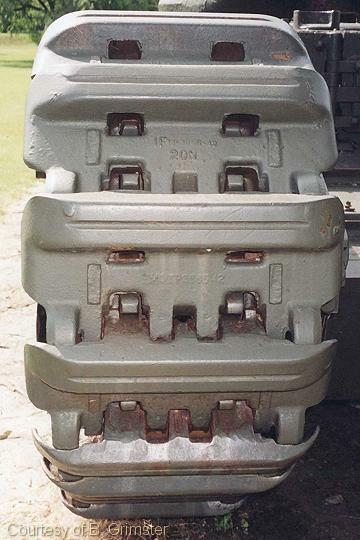 Early in 1941 it had been recommended to the Tank Board that any heavy or fast vehicle should be equipped with manganese tracks as this material had a better shock resistance. A new manganese track was designed for the Churchill and prototype was available for testing by 13th August 1941. Unfortunately there was a shortage of production capacity to manufacture the new track and after discussions between Ministry of Supply and Vauxhall it was recommended that not only should the new manganese track under go test but that "a Ford Iron Track made from the Manganese steel pattern should be tested as soon as possible" as well. The sequence therefore appears to be that whilst the manganese track was the preferred successor to the Heavy Cast Steel track, shortage of available available production capacity ensured it would be the last type to be introduced into production. 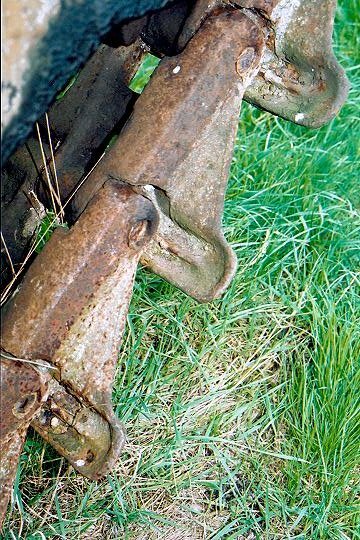 The early Churchills were plagued with track and suspension failures. The Heavy Cast Track has gained a bad reputation as a result of track failures during the Dieppe raid (although this is a much debated subject). There is some evidence to show that there were some initial problems with the Manganese track as well. 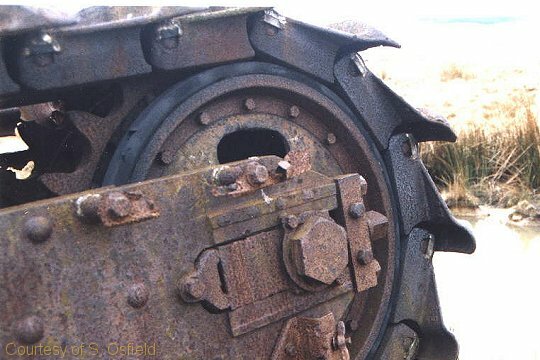 In a field trial report on reworked Churchills issued in July 1942 the Department of Tank Design reported that one vehicle developed "cracks in the webs behind the centre lug" on no less than ten links. On one link the centre lug broke away altogether "shearing off or damaging most of the sprocket ring retaining bolts on both the final drive and idler wheel." These faults had occurred after only 84 miles testing (although whether this Track was fitted new during rework is not stated). The 'problem' track links were apparently manufactured by Singers and were duly replaced by "similar links produced by Butterly Foundry Co." Later in a preliminary report on Churchill tanks of 1st Army in Tunisia (26/03/43) the manganese track is reported as not having proved as good as the cast track. Unfortunately the report does not go into any further detail though it may be significant that during the Tunisian campaign some very heavy going was encountered. 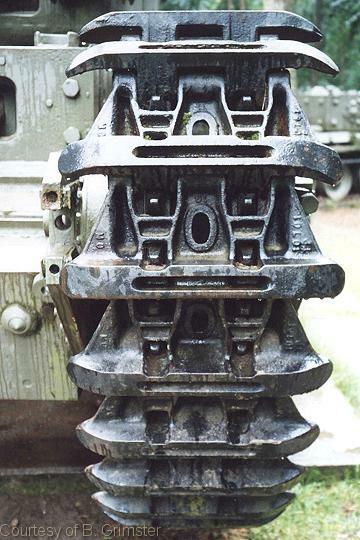 Despite the 1942 assertion that manganese track would be preferable for heavy vehicles, it is noticeable from photographs that many AVREs, Gun Carriers and even Post war flails were fitted with the Heavy Cast Track. There are also plenty of photographs of vehicles in the later stages of the war in Europe still fitted with the Heavy Cast Track. The implication is that there was that weight of vehicle was not a deciding influence in track choice which was more likely to have been made based upon the expected terrain conditions for a particular vehicles role. Thus the Manganese Track and Light Steel Track were favoured for mixed running i.e. roads and fields. Heavy Cast Steel track was preferred for fields and mud i.e. heavy going. The Heavy Cast Steel track was initially introduced with the MkI Churchill but was later used on MkI-MkIVs (and derivatives). It is easy to distinguish from the other two types being rectangular in shape. Each link weighed 59.25 lbs and had a pitch of 8.3125 inches. Each track was made up of 70 links and unlike the later types the design was such that the sprocket engaged the track at the centre of the link. The original method of pin retention was by means of an anvil plug and keeper. The outer bosses of the track link contained a circular groove into which the tongues on the keeper were pressed when it was driven home against the keeper. An alternative method was to use a steel strip, sprung into the circular groove, locating the pin endways in a similar manner but without the need for the anvil plug but requiring extra distance pieces. 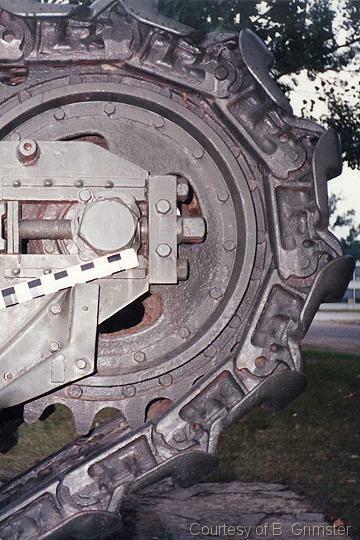 The Light Cast Steel Track engaged the sprocket at the end of the link and was almost identical in pattern to the to the Manganese track from which it was derived. Each link weighed 48.5 lbs and had a pitch of 7.96 inches. 70 links were required for each track. One noticeable difference from the Manganese Track was the addition of a strengthening rib on the inner face (see below). 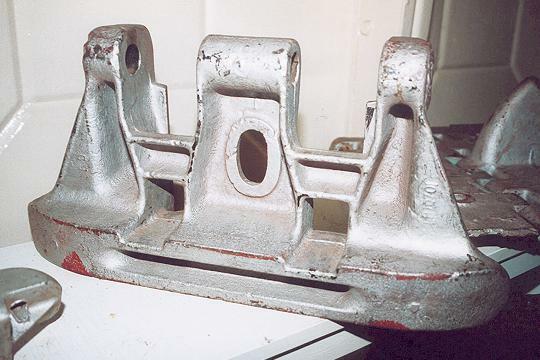 The track pins were retained by the sprung steel strip method as described for the Heavy Cast Steel Track and as illustrated below. The Manganese Track is at first glance identical to the Light Cast Track. The link pitch was identical at 7.96 inch and each track consisted of 72 links. The only practical differences being a slightly lighter weight (48 lbs), absence of strengthening ribs and the method of track pin retention. 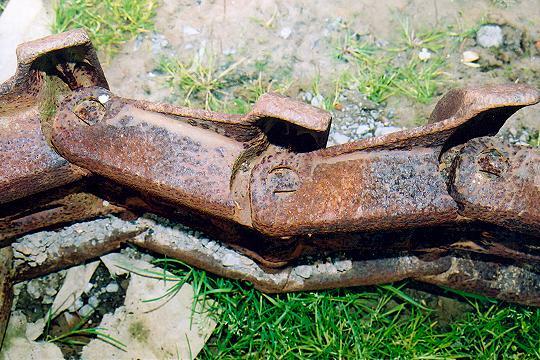 The pins were retained endways by a strip of steel welded to the side of the track link covering approximately half the hole. This can be seen quite clearly in the photograph below which also nicely illustrates the rubber tyre on the idler and the track tensioner mechanism. Clearly there would be occasions when tracks need repair but welding equipment would not be at hand and so for the Manganese track a service pin was introduced. These pins had radial grooves machined into them so that when the track was tensioned, the inner bosses of the links would engage in the grooves thereby holding the pin in place without the need for external retainers. The recommended use of service pins seems to vary with Mk of Churchill. The service booklets of the earlier Mks implies that they were generally used for joining lengths of track and advises that as many as six service pins could be fitted in each track provided none were adjacent. The MkVII instruction booklet however is much more restrictive on there use instructing that they should only be employed as temporary field fix and that they were to be replaced at the earliest possible opportunity. Notice in the above photograph the absence of the strengthening ribs present on the Light Cast Steel Track.